Jim Burns	Quick mends2020 Greenway Plan, ARBOR, Carol Armstrong, FOLAR, Lewis MacAdams, Los Angeles River Ecosystem Feasibility Study, Los ANgeles River Revitalization Corp. While river advocates await the public unveiling of the Los Angeles River Ecosystem Restoration Feasibility Study (nicknamed ARBOR), the p.r. battle for Angelino hearts and minds has already begun. In September, after several years of drafting and almost $10 million in cost, the U.S. Army Corps of Engineers will release four alternatives, each with a different cost, and each with a different impact on the river. The public will then have 45 days to comment before a single alternative moves forward. “It’s a doozy,” said one person close to the study, which is currently undergoing legal review. Think of it in terms of a Beverly Hills plastic surgeon’s menu of procedures. You could go for some Botox injections to temporarily solve that wrinkly face, or throw in for a full-blown, long-lasting, facelift. The facelift alternative is what the nonprofit Friends of the River advocates with the “Piggyback Alternative,” known to the Corps as Alternative 20. It is the most comprehensive approach to river restoration, according to FoLAR president and founder Lewis MacAdams. The estimated price tag is $1 billion-plus to restore and remake 11 miles of the river between Union Station and Griffith Park. Today, the Los Angeles River Revitalization Corp, another nonprofit, threw down with its 51-mile greenway project, which aims to have that much yardage in bike paths and foot trails along the river by 2020. That would essentially cover the entire length of the river from the San Fernando Valley to Long Beach. Currently, 26 miles along the river are open to bicyclists before they have to hit the mean streets, just north of downtown. Although not one of the alternatives, the 2020 Greenway plan aligns itself more naturally with Alternative 20 than with Alternative 13, said to be the Corps favorite in these times of tightening budgets. I’m grateful to you for writing about this. 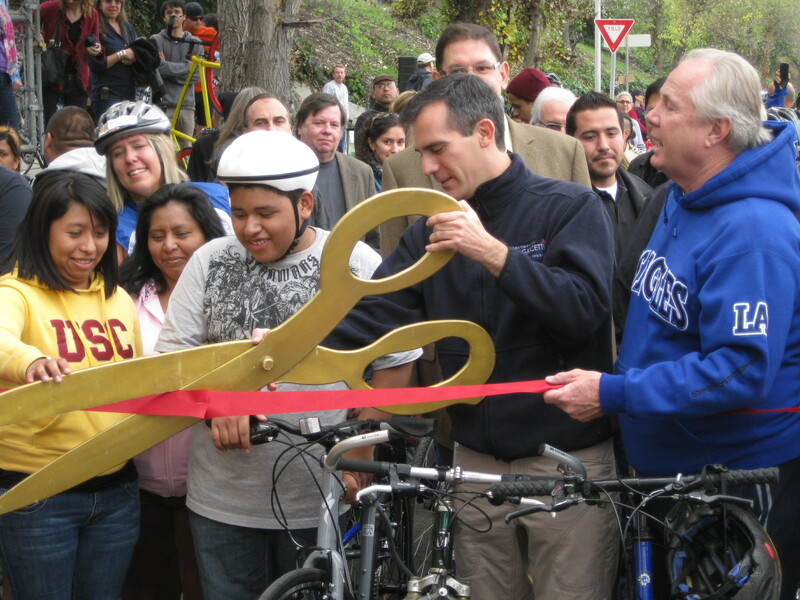 The Arroyo Seco Foundation is looking to fund their own feasibility study of the Arroyo Seco from the northernmost point to the confluence with the L.A. River for the addition of a contiguous bike route. This effort has the added benefit of creating a public consciousness about the rivers as a whole and will help to instill a vision of restorative support for the value of river health. May the synergy aroused be beneficial to all. That’s great, didn’t know about it. What a wonderful bike ride that would be! The people have already done such a study to jump start the greening of the L.A. River. Picture a bucolic stream, a tree-shaded picnic area, a path for walkers and equestrians, a playground for little ones, and athletic fields to enjoy soccer and other organized sports. Now picture it all in an easily accessible area of Griffith Park near working class families with a stunning view of the hills and river.